The Illinois Bicycle Lawyers of Keating Law Offices were recently retained to represent a Chicago Bicyclist who was "doored" by a cab driver on August 29, 2013. On that date, the bicyclist was riding southbound on State Street towards its intersection with Erie Street. At the same time, a cab driver was picking up a passenger in front of the Dana Hotel located near the intersection. As the cab driver waited in the cab for his passenger, he suddenly opened the driver's side door of his cab directly into the bicyclist's path, causing the bicyclist to crash into the cab door and fall from his bicycle, sustaining serious injuries. The Chicago Police Department responded to the scene and issued a citation to the cab driver under Section 5/11-1407 of the Illinois Rules of the Road. This provision explicitly states, "No person shall open the door of a vehicle on the side available to moving traffic unless and until it is reasonably safe to do so, and can be done without interfering with the movement of other traffic, nor shall any person leave a door open on the side of a vehicle available to moving traffic for a period of time longer than necessary to load or unload passengers." Despite efforts to raise awareness, dooring remains a serious issue in the Chicagoland area. In 2012, doorings caused approximately 250 bicycle collisions in Chicago's city limits. To combat Chicago doorings, Mayor Rahm Emmanuel recently required the placement of stickers on the rear passenger windows of all Chicago taxicabs that state, "Look! Before Opening Your Door." In addition, in June 2013 the Chicago City Council approved the 2013 Bicycle Safety Ordinance which increases the fine for dooring a bicyclist. Keating Law Offices has represented numerous bicyclists doored by motorists. Keating Law Offices is a Chicago-based firm of trial lawyers who represent clients throughout Illinois. 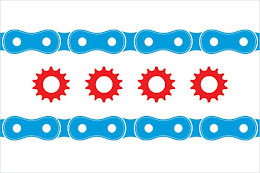 They are the leading Illinois firm in the field of bicycle litigation. If you have any questions regarding this post or an issue involving bicycle law or litigation, please contact Illinois Bicycle Attorney Mike Keating at 312-208-7702 or MKeating@KeatingLegal.com 24 hours a day, 7 days a week.